NLP is an accessible model to enhance effective communication, personal change and personal development. NLP explores how we think and feel and studies or 'models' excellence in every walk of life. NLP is first and foremost about → action. By using NLP you can give yourself more conscious choice over what you do and the way you act. Using NLP at work and in your personal life will sharpen your skills and boost your achievements. The theories and practices of NLP will help you discover what makes some people excel in all aspects of their lives, and will enable you to do the same. The awareness of how you do what you do is the key to self-management and influence. You can't control people or events, but you can manage your response to them. Your skill and your ability to manage yourselves directly affect the extent to which you achieve → your goals. NLP has given rise to a trail of techniques that can be used both personally and professionally. They are used internationally in various business areas and enable you not only to reach and influence others, but also to reach and perfect the different parts of yourself. 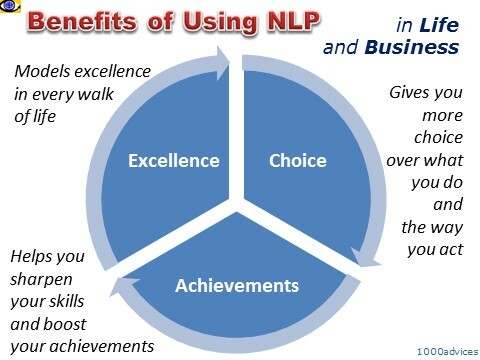 NLP can also help managers analyze success secrets of their best employees applied by intuition and teach others these secrets, thus "cloning" success without cloning people.